The Downtown Westfield Corporation (DWC) is the management entity of the Special Improvement District and began as Main Street Westfield. DWC's old website had a large amount of content and was developed many years ago on a cobbled-together content management system. They needed a modern content management system that would make it easy for them to update the site, and would also provide a foundation for future expansion of features and functionality. Also, they liked the basis of their brand and didn't want to change too much because the city also uses it in some of their marketing, but they wanted to freshen it up a bit and develop a style guide to help maintain consistency in usage. The responsive website design includes features such as automatic updates to the homepage based on specifically-tagged blog posts, an Instagram module that displays their most recent posts, a searchable categorized business directory with almost 500 businesses and an integrated interactive map. In addition to address and contact info, each business directory listing can also include a logo, description, map location, photo gallery, and videos. After designing and developing the site, we also migrated hundreds of pages of content from the old site into the new one. 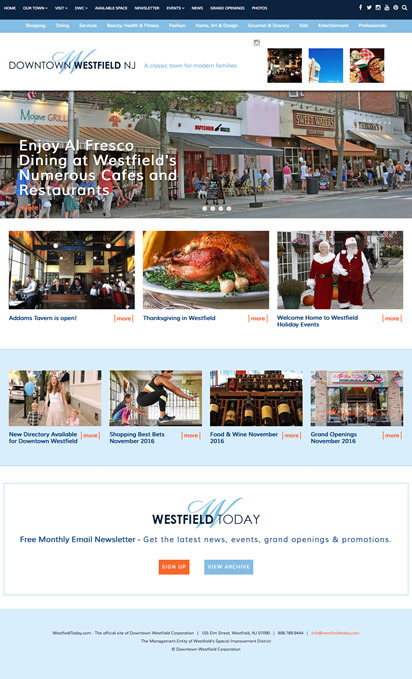 The site launch was the culmination of a year-long project that began with Main Street New Jersey awarding Downtown Westfield Corporation a Branding and Digital Design grant to work with Glerin on the rebranding and marketing strategy for Downtown Westfield. The other grant recipient was Main Street Vineland/VDID.